As such, sports medicine is an area of medical practice concerned with the treatment of injuries resulting from athletic activities. A physician practicing sports medicine focuses on sports-related medical services. At Action Sports Clinic, our sports medicine physician is integrated into our team, providing a variety of roles, including general sports medical treatment and direct consultation with patients and other members of the clinical team. As an expert in providing care for orthopaedic and sports injuries, often we utilize these specialized services to provide advanced levels of triage and care as deemed necessary. Under the umbrella of sports medicine practice at ASC, we can provide advanced injection therapeutics such as Platelet Rich Plasma (PRP), Prolotherapy, general pain management, and referral service to other health care practitioners in our region. Our sports medicine doctor has trained in the most up-to-date treatments of sports injuries and arthritis. 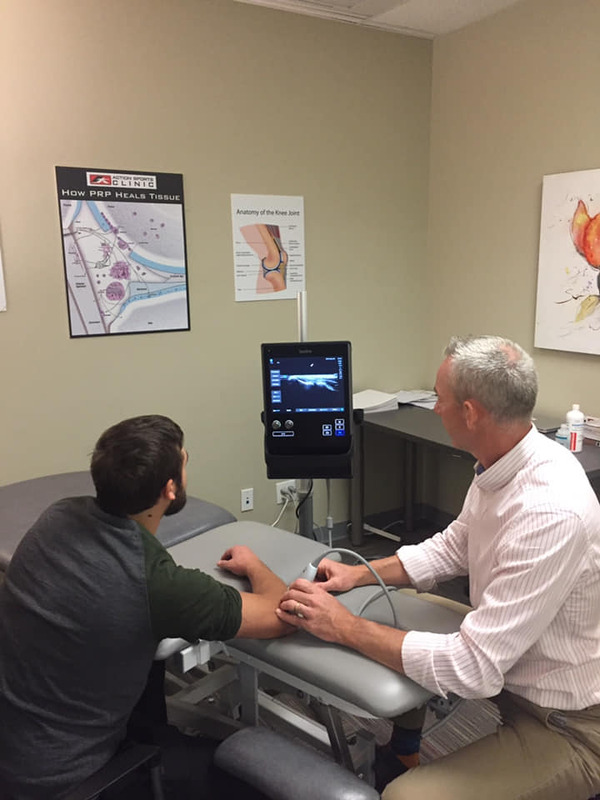 By using the most up-to-date treatment methods, and an industry leading-ultrasound machine to specifically target your injured tissues and joints, you can rest assured that you are receiving the highest level of care. Treatment options that Action Sports Clinic might recommend for you are listed below. Feel free to give us a call to ask about any of these specialty services offered by out sports medicine specialist at Action Sports Clinic. Platelet rich plasma (PRP) is a treatment for the pain of injured tendons, ligaments and joints. In a single visit to the office, we take your blood, spin it down in a centrifuge, and re-inject the plasma part back into a painful or injured body part. This plasma is now super-concentrated with loads of growth factors that stimulate the healing process, and a natural blend of anti-inflammatory cells. This treatment is generally required only 1-2 times for tendons and ligaments, and usually 1-2 times per year for more seriously injured or arthritic joints. Payment is not provided by Alberta Health Care, and is rarely covered under private insurance plans. Please Call or Schedule your appointment for more information. *An extended treatment session can be used to treat different body parts, and can be quite cost effective. Prolotherapy is a treatment for weak, torn or painful ligaments and tendons. It involves injecting anesthetic and glucose into those ligaments or tendons. It immediately stimulates healing of weak ligaments or tendons, and this healing occurs over the coming months. These injections are repeated for several visits about 1 month apart, each visit building on the last, anywhere from 2 – 6 times. Payment is not provided by Alberta Health Care, and is rarely covered under private insurance plans. Perineural injections and Fascial hydrodissection treatments are somewhat similar to nerve blocks and work by 5% dextrose, an anesthetic, and sometimes a micro dose of an anti-inflammatory steroid to calm the nerve’s pain receptors. Once this happens, irritated and swollen nerves can start to return to normal size, function and pain level, and often don’t get squeezed as they wind through narrow openings in the body’s fascia and other connective tissues. These injections are repeated for several visits about 1-2 weeks apart, usually 5-10 times, each visit building on the last. Payment is not provided by Alberta Health Care, but might be covered under your private insurance plan. Joint Lubricant injections are treatments for painful, inured or arthritic joints. These lubricants have been engineered by the pharmaceutical industry to meet the needs of patents who are trying to avoid joint or cartilage surgery, waiting for surgery, or in pain after surgery. They are generally required only 1-2 times for minor injuries or mild arthritis, and usually 2-3 times per year for more seriously injured or arthritic joints. Payment is provided by Alberta Health Care for the injection but not for the joint lubricant medication itself, which is often covered under private pharmaceutical insurance plans. Cortisone injections are injections into painful joints or near painful tendons to help reduce inflammation and pain. Used for nearly 80 years, these are very effective short-term treatments and should only be used when they are a small part of a structured recovery program. When used, they are best delivered with X-ray or Ultrasound guidance to ensure they are delivered to their intended target. They are generally regarded as safe, however most experts agree that they should only be done no more than 3 times for an injured joint or tendon, and no more than every 3 months for an arthritic joint. Payment is provided by Alberta Health Care for the injection but not for the cortisone medication itself which is $20 or less. Nerve blocks are injections using local anaesthetic and a low dose anti-inflammatory steroid to switch off the painful nerve and break the pain cycle. In a few cases, this is all it takes to significantly reduce pain. When used, they are best delivered with X-ray or Ultrasound guidance to ensure they are delivered to their intended target. They are generally regarded as safe, however most experts agree that they should only be done no more than 3 times for the pain coming from an irritated nerve, and no more than every 3 months for the pain coming from an arthritic joint. Payment for a very brief appointment only for a nerve block is provided by Alberta Health Care but not for the anesthetic and cortisone medication itself which is $20 or less. Trigger points injections are targeted at tight or painful spots in muscles. We release the tightness in the muscles with an injection of an anesthetic. In a few cases, this is all it takes to significantly reduce pain in muscles. These injections are repeated for several visits about 1-2 weeks apart, each visit building on the last. Payment for a very brief appointment only for a trigger point injection is provided by Alberta Health Care, but not for the anesthetic medication itself which is $20 or less.